To my mom who loved me first and most. Who gave me her laugh, her birthday, her smile and her passion for her kids. To my mom (in-law) who gave me her baby son. Who gave me her love of fitness, love of life and love of God. To my sisters-in-mommyhood. The first moms of my boys. The ones who gave my boys their smiles, their love of life, their beauty and immense amounts of love before I could. Every day, I live every day with our hands wiping our son’s tears, our lips kissing our son’s cheeks. We do this together, I feel it all of the time. To my sisters. My sisters who gave me nephews and nieces. Lights in my world. To my aunts and cousins (biological and in-law) who inspire me, delight in my kids and love beyond words. To my friends. Oh my friends. The ones I lean on when I don’t have the strength to stand on my own. The ones I look to for inspiration, hope and joy. The ones I feel across states, across countries. We stand with our hands intwined and that smile on our lips. To my friends who are waiting. Waiting for word of their first kids. Waiting for word of their second or third or fourth kids. Friends who are waiting and have been waiting for too long. The mothers who have not mothered. Your heart and strength are beyond words. To my husband who loved me enough to choose me to mother his children. Who writes sweet things and kisses sweet kisses. That husband who is my better half. My equal partner. The man who makes me think I’m truly capable of anything, including mother this brood of ours. And to our kids. The ones who woke me up with “Happy mothers day to you”, omelets, pancakes, homemade syrup, coffee and Orange Juice. The ones who wrote me the sweetest things and told me throughout the day how much they loved me. These kids who set in motion this life that I am immensely grateful for. I’m quite convinced that when I die they’ll find my heart is 5 times the size it’s supposed to be. Not because of ill health but because I’ve loved more than anyone has loved before. Because of them. Because they are everything to me. They really, really are. Holding the hand of my daughter (with my sister) while she got her ears pierced. 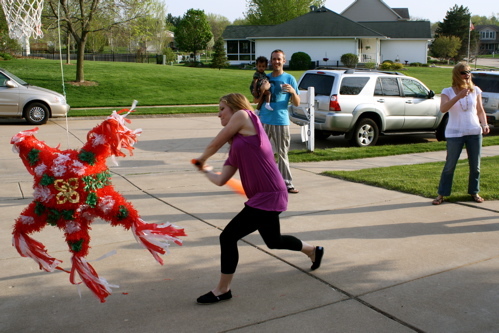 Beating the candy out of a pinata. The very best mothers day of my life. No question. Enjoyed reading this 🙂 Happy Mother's Day to you! Now why didn't I think about a pinata for Mother's Day? That's why you're so cool. Grace is God's gift to me. He taught me all about love and mercy and faith and kindness. I love you for loving me and all your brood. What bliss! Happy Mother's Day all over again. What a beautiful day for you. You deserve it! 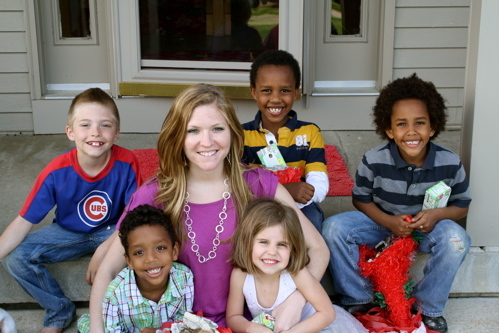 every time I think your family could not be more beautiful, you go and prove me wrong…. You are so sweet:) Thanks for sharing. Ahh….mommy perfection. What a wonderful mother's day tribute to you and yours! love it!